Do we still need printed newspapers? For many years I have had a newspaper subscription. When the digital version of the newspaper was introduced, I very quickly switched to the electronic version. It is easier, more practical, always to hand and one can search the archives. It is also friendlier to the environment, because not a single tree has to be felled because of my reading mania. But I read the electronic issue differently from the printed paper. In the electronic version my approach is very focused and I really only look at what interests me particularly. I don’t even click on other topics and advertising annoys me terribly. Every advertisement is clicked away immediately, usually before it is even clear what they are advertising. The advertisements, which force me to watch them for a few seconds before I can remove them, make me so mad (after all someone is trying to force his will on me) that the supplier has no chance at all with me. The printed issue is different. I leaf through the whole newspaper, frequently become interested in a subject, which I had skipped in the electronic version and read both the death notices (in the electronic version never) and even some of the advertisements. And that is good, because only in this way do I discover some exciting events, which I then attend and am grateful that I had discovered them at all. In the last issue there was the Swiss championships in Poetry Slam and also a lecture about Japan. 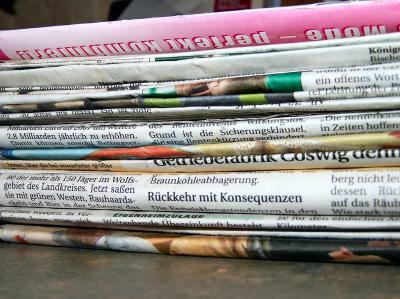 What is the future of printed newspapers? I fear that in 20 years they won‘t exist any more. Then I’ll presumably have to change the way I read the newspaper. But there are worse things. To close, the professional information: the electronic version of the newspaper, which in the past carried a higher VAT rate than the printed newspaper, is now treated equally. Following the partial revision of the Swiss VAT Law at 1.1.2018 both are charged with the reduced VAT rate. I’m very pleased about that. It doesn’t matter that you hadn’t even noticed. But you can still be pleased. Categories: My Blog | Tags: Growth, information, news, technology | Permalink.